The RBI Monetary Policy Committee (MPC) kept the key policy rate (repo rate) unchanged at 6%. Consequently, the reverse repo rate remains at 5.75%, and the Marginal Standing Facility (MSF) rate and Bank Rate remain at 6.25%. The RBI MPC voted (5 – 1) in favor of keeping the policy repo rate unchanged at 6.00%, while maintaining the ‘neutral’ stance of the monetary policy. One of the MPC members was in favor of 0.25% repo rate cut. RBI highlighted that Consumer Price Index (CPI) inflation touched a 7-month high in October 2017 at 3.6%, while food inflation also picked up to 1.9%. Meanwhile, core inflation (excluding food and fuel), which increased from July to September, remained steady in October at around 4.6%. But RBI said that the upward trajectory in core inflation may continue in the near term. The RBI’s survey of households showed inflation expectations firming up in the latest round for both three months ahead and one year ahead horizons. The central bank also increased its inflation projection for second half of FY18 by 10 bps, from 4.2-4.6% in its October monetary policy to 4.3-4.7% in this monetary policy, with risks evenly balanced. Further, the central bank said that the rise in vegetable prices may see some seasonal moderation in winter, and also that the recent GST cuts may translate into lower retail prices going forward. This may help to mitigate some upside risk to inflation. RBI is committed to keep inflation anchored around 4% target. In this policy statement, the RBI retained the estimate for India’s gross value added (GVA) at basic prices for FY18 at 6.7% (with risks evenly balanced). GVA rose in Q2 of FY18 to 6.1%YoY from 5.6%YoY in the previous quarter, and after five consecutive quarters of deceleration. Manufacturing sector growth especially rose from a 5-year low of 1.2% in Q1 FY18 to 7.0% in Q2 FY18. RBI said that Q2 growth was lower than that projected in the October resolution, and the recent increase in oil prices may have a negative impact on GVA growth. However, on the positive side, there has been some pick up in credit growth in recent months and recapitalization of public sector banks may help improve credit flows further. As expected, the RBI kept key policy rates unchanged and maintained a neutral monetary policy stance, with a slightly hawkish view on inflation. 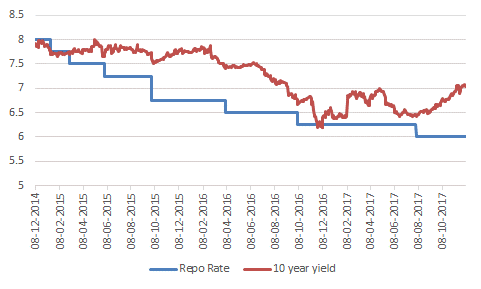 From beginning of September, the 10-year benchmark bond yield has hardened by around 55 bps to above 7%, which could be attributed to rising inflation owing to reversal in food and crude prices along with HRA impact, concerns of fiscal slippage and hardening of global bond yields. The 10 year bond yield had fallen by 10-15 bps in November after India’s sovereign rating got upgraded by Moody’s, and on cancellation of an OMO (Open Market Operation) sale of Rs. 10,000 crores by the RBI in late November, but the yield quickly retraced back to above the 7% level by the end of the month. After the policy announcement today, bond yields softened marginally, with the 10 year yield closing at 7.03%. With rising inflation and crude oil prices, withdrawal of monetary stimulus by major central banks, and concerns of fiscal slippage, the RBI has limited elbow-room for any rate cut in the near future. It looks presently that the interest rate cycle in India has bottomed out, unless inflation and economic growth surprises significantly on the downside. That being said, the improving macro-economic scenario of the Indian economy presents good investment opportunity for Policyholders. 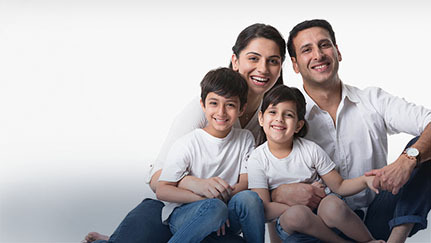 Policyholders would be well placed to benefit from the economic revival if they continue to pay their premiums regularly and remain invested in the India growth story.